We’ve been noticing that lots of people have been asking for organic or ‘eco’ yarns lately, so I thought it would be neat to show some of the options that we have. This is a very very tricky topic because so far we have no industry standard for what “eco” or “organic” really means! In some cases it refers to the base yarn (typically organic cotton is the most common, as it’s tougher to guarantee organic wool), and in some cases it refers to simply undyed yarn. Or both. Or in some worrying cases of misleading branding, neither. I’ve included what I hope to be a good cross section below. 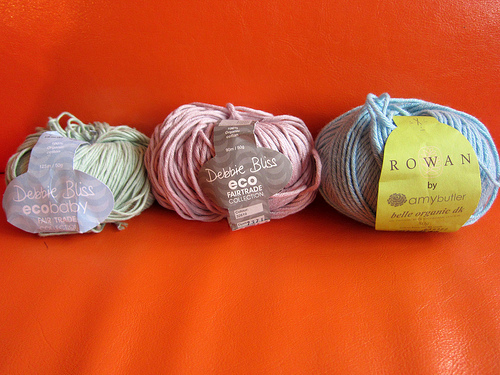 Let us know if you have any favourite organic or eco yarns! 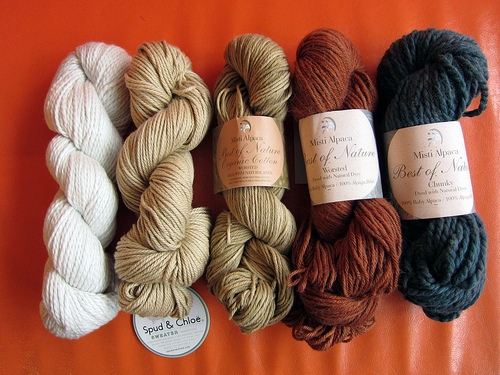 In this first photo, form left to right: Blue Sky Alpacas Worsted Cotton, Spud and Chloe Sweater, Misty Alpaca Best of Nature Organic Cotton, Worsted, and Chunky. 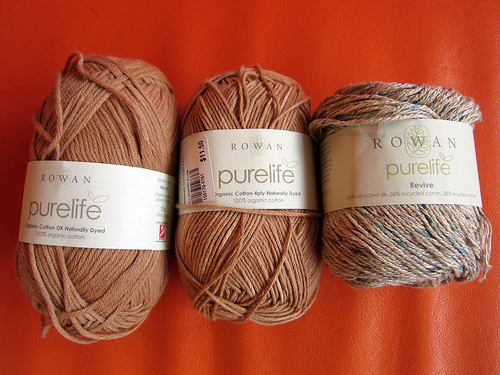 In this photo, Rowan Purelife Organic Cotton Naturally Dyed DK and 4ply, and Rowan Purelife Revive (made from recycled fibres). And finally, Debbie Bliss Eco Baby, Debbie Bliss Eco Aran, Rowan Belle Organic DK (there is also an aran weight which is not pictured). Also not pictured is the Cascade Eco and Eco Cloud. Note that the Cascade Eco and Eco+ are the same base wool – the Eco is undyed, the Eco+ is dyed with standard chemical dyes. This entry was posted on Friday, January 25th, 2013 at 12:02 pm	and is filed under Uncategorized. You can follow any responses to this entry through the RSS 2.0 feed. Both comments and pings are currently closed. I really like the Ecobutterfly brand. It’s organic and comes in an array of natural colours depending on the plant it came from….from white/beige to greens.